Butterfly bush ‘Black Knight’ is a wonderful deciduous shrub. Buddleja davidii ‘Black Knight’ has spectacular summer flowers. These deep purple spikes are very fragrant and will attract wildlife – giving the butterfly bush its name. This feature makes the buddleja a favourite for many gardeners. ‘Black Knight’ is suitable as a border or accent plant. It is hardier than other buddleja varieties, although it may die to the ground in particularly harsh winters. This butterfly bush is suited to loam, chalk, sand and clay soil, making it suitable for difficult soil types. It will thrive in full to partial sun with a south, east or west-facing aspect. The butterfly bush prefers soil that is moist but well drained, but otherwise it is a fairly undemanding plant. Buddleja ‘Black Knight’ can attain an ultimate height of 2.5-4 metres, and an equal ultimate spread, during a five to ten year period. 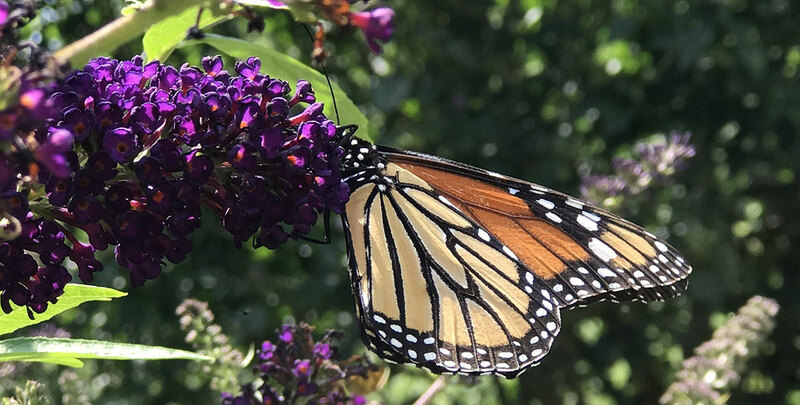 Butterfly bushes are fast growers and thrive easily. This hedging plant requires moderate upkeep – ‘Black Knight’ needs regular deadheading and must be pruned vigorously, to the ground if desired, in late winter to early spring. Pruning hard in March is ideal to promote dense spikes of the ‘Black Knight’s’ characteristic fragrant, dark purple flowers, making it a beautiful addition to summer borders. Regular deadheading prevents unwanted seedlings while also helping to promote flower growth. Despite being known chiefly as a summer plant, buddleja ‘Black Knight’ retains colourful interest in autumn when its pointed grey-green leaves turn to a butter-yellow colour. Another feature which makes the butterfly bush a favourite for garden enthusiasts, is the fact that it blooms late in summer. As other flowers begin to fade, buddleja gives fresh interest to borders and shrubberies with its show of colour and delightful honey-scented blossom, drawing bees and other beneficial insects to your garden.